I just got back yesterday from an incredible service-themed Young Adult weekend. It didn’t start out all that well for me, though. The day before I left I started feeling nervous (which is normal for me going into social events) but then by the time I left on Friday I had a shaking-crying-hyperventilating panic attack (which is becoming less and less normal/frequent for me). … and hit heavy traffic and rain (my two least favorite things to drive in). That left me running 20 late to met the people I was supposed to be car pooling with to the house I didn’t have an address for. Thankfully, one of the people I was meeting is also one of only 2 out of 100+ people at the weekend with my phone number, and he texted me the address. I proceeded to enter said address in my GPS and it took me to a house with no cars in the driveway. It is either a testament to my stupidity or my faith that I walked up and rang the doorbell. Turns out, my friend accidentally sent me to another church member’s home (whose name I recognized, though I’d never met them) and they fed me cheese, gave me the correct address, and sent me on my way. Oddly, that’s when I felt a sense of peace for the first time all day. I was late, I was temporarily lost and yet God showed me that these worries coming true weren’t anything He couldn’t handle. Saturday brought a great round of seminars and an excellent sermon on foot washing and Passover. Nothing to worry about, until game night happened. I’m sure I’m in the minority judging by how many people said they had a wonderful time, but any sort of game that involves doing something in front of other people or in a group or on a team makes me intensely uncomfortable, especially if you add competition. The first two games were mixers where you asked someone a question and their name. I literally remember nothing from meeting people this way (does it even count as a “meeting” then?). Next was that game where you tie a balloon to your ankle and try to keep it from getting popped while popping everyone else’s balloon. I could have kissed whoever it was that popped my balloon the moment the game started. I think one of the biggest lessons I learned this weekend was that my fears were either 1) groundless or 2) didn’t have the power to hold me back. The fact that I had a panic attack before leaving turned into a blessing because it gave me the choice between either canceling my plans or praying through it and trusting God. I chose the later, and I kept encountering situations that could make me feel nervous and which reminded me to stay in prayer all weekend. Every single one of the things I was worried about worked out for the best, and the only part of that I can take credit for is that I took the step to go to the weekend and start a few conversations. The rest was all God. 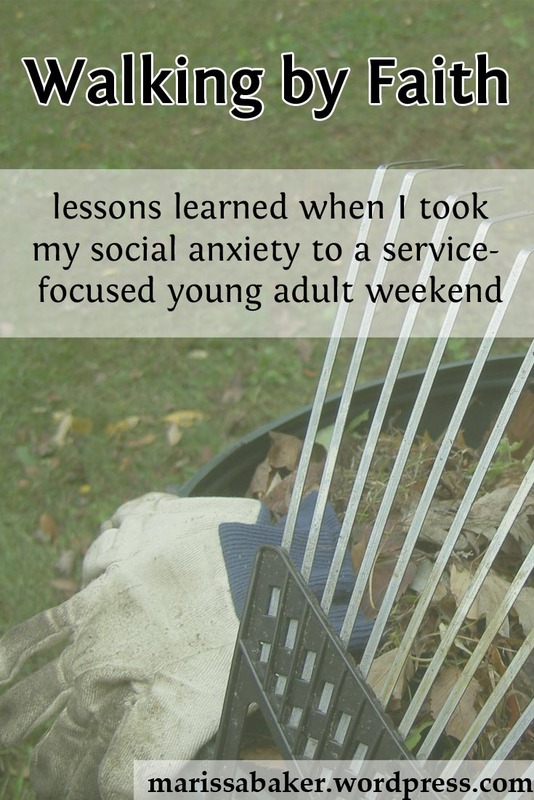 This brings us in a very round-about way back to the topic of the weekend — service. Specifically, “Unlocking Your Desire To Serve.” As many of you know, I consider this blog a sort of ministry and it’s been growing in ways that amaze me and make me want to do more. One of the big things that holds me back is my own fears, including my fear of panicking when it’s important that I talk with people about my faith. So for me, blending this weekend’s focus on service with a need to rely on God for help working through my anxiety was a powerful experience. Something I haven’t shared with many people is that in my local Messianic congregation I’ve been receiving words, prayers, and hints from brethren for the last several months along the lines of “God’s going to do something big in/with your life soon.” I even finally have a hint as to what that might involve after I came back from services a few weeks ago with a title for an e-book in my head which I promptly sat down and outlined. I’ve barely worked on it since, but this weekend was exactly what I needed to reconfirm that God wants me to be sharing my gifts through writing and that He’s more than capable of overcoming deficiencies on my part. My first step is officially announcing the project here on this blog. The working title is “Rise Up, My Love” and the focus will be on reigniting the church’s passion for God (so, basically this blog in book form). I’m not committing to a release-date quite yet (it would be lovely to have it out by Sukkot/Feast of Tabernacles this fall, but I think a full year might be more realistic judging by how long it took to write The INFJ Handbook). I’ll keep you posted on details. ← Why Do We Keep The Passover?